Naturally we have to start with the fact that a new ALL-TIME HIGH SCORE was set at the start of July, with The Bastards attaining one more point then the previous record set by the Cunning Stunts on June 4th, 2014. The Bastards, of course, also hold the High Score mark at Lou Dawg's Ryerson for the month of July. 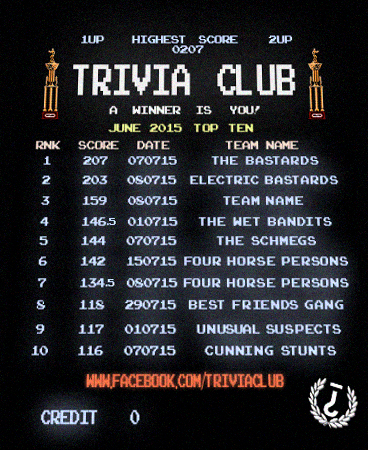 We would be remised if we didn't add the fact that the Electric Bastards became only the third team in top the 200-point plateau in Trivia Club's Expansion Era. The Electric Bastards therefore attained the highest score at Cardinal Rule for this month, and the second-highest score at the Original Home of Trivia Club, all-time. Interestingly enough, it's also the second month in a row that the reigning Grand Champions had the month's second highest score. A rising tide raises all ships, it seems, as six of the Top Ten High Scores for July came from the two nights in which the winning teams hit that Double Century Mark. After missing out on Top Ten representation in June, seven of the Top Ten High Scores come from Cardinal Rule, while the other three from Lou Dawg's Ryerson (specifically July 7th, the night in which The Bastards set the new all-time high score). The highest score at Hitch, for the month of July, belongs to Five Neat Guys with 104 points. That total is good enough to tie them with Team Name for 11th overall on the month. Team Name does in fact appear on the Top Ten list itself, with a point total that still passes the Sesquicentennial Mark. Five Neat Guys ALSO appear on the list, with their winning total at Cardinal Rule as The Wet Bandits. The only team to appear twice on the Top Ten proper, are the Four Horse Persons of the Apocalypse! Interestingly enough, the 7.5 point difference between their sixth and seventh place spots meant a Golden VHS and third place, from one week to another! Due to a historically high top two spots, this month's Mean Team are The Wet Bandits! 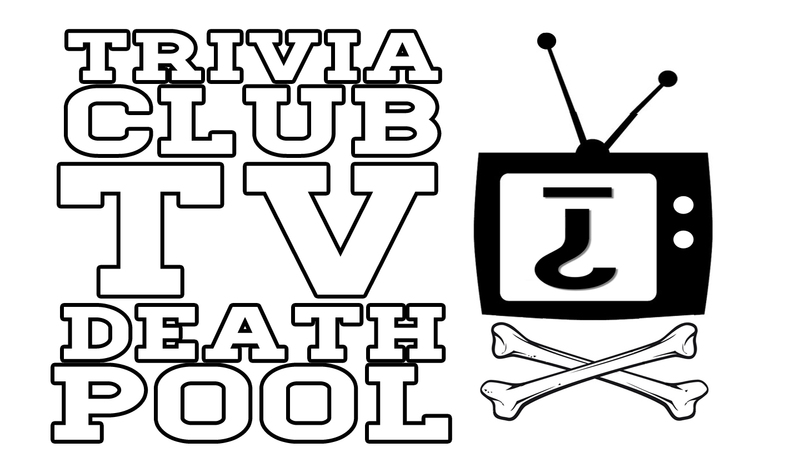 In the tradition of the Summer Movie Wager, the Oscar Confidence Pool, the Saturday Night Live Fantasy League, and so much more before it, it’s the SECOND ANNUAL Fall TV Death Pool, celebrating the worst network television has to offer for the 2015-2016 season! Congratulations, of course, go to our inaugural winner fromlast season, Patrick! Was it his belief in Jane the Virgin that won it for him, or was it the trust in the Big Four’s bad choices that truly brought the room together? Either way, Patrick beat his nearest competitor by 10 episodes! Now, normally, we at Trivia Club try to be as positive as possible when it comes to all things pop culture! We firmly believe that there is no high culture and low culture, simply culture! You should enjoy your opera with your Any Which Way But Loose! You should ALSO, however, be realistic about what the newest network television “pilots that could” can and can’t do! We live in a GOLDEN AGE of television after all, so it’s our responsibility to give harsh and unfair judgment to the shows we haven’t seen simply because they’re on the channels that started this whole business! Provided below are the new shows that will be airing on ABC, CBS, FOX, NBC, and the CW! Participants will choose FOUR NEW SHOWS, and ONE RETURNING SHOW, that are set to premiere at the start of the new TV season, from the five networks. You can choose from any of the networks, as long as each of the five networks is represented. The objective is that you want to choose shows that will air the least number of episodes on television, as you’ll get one point per episode aired (not ordered, remember). We’ll also be adding a wrinkle in the second annual TV Death Pool, with mid-season replacements! Participants will also choose ONE MID-SEASON REPLACEMENTS from ANY of the five networks, with the amount of episodes that air SUBTRACTING from the total of the participants new and returning premiere shows. So as a silver-ling, you want to choose a mid-season show that succeeds after your other shows have failed, with the lowest episode total winning, by season finale season if not sooner! If that’s clear, and you would like to participate, then send your chooses to Trivia Club on Facebook or Twitter with the DEADLINE on SEPTEMBER 20TH, 2015 (yep, get ‘em to us by the Emmys)! The Inanimate Carbon Rods top the month of June by just one point, bringing home not only Hitch's top score of the month with 156 points, but also becoming the second Hitch team in a row to top the Monthly Scoreboard. Just one point behind those ICRs, are the reigning Grand Championship team of The Electric Bastards with the top score of the month at Lou Dawg's Ryerson with 155 points. 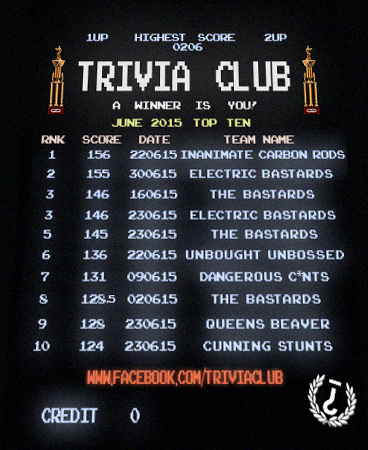 Tied in third on the Monthly Scoreboard for June are The Bastards, along with the Electric Bastards once again. Together, the two teams take up five spots on the month's Top Ten! Also appearing multiple appearing multiple times were the Cunning Stunts, who went by the name Dangerous C*nts on June 9th, 2015. You may have noticed that a score at Cardinal Rule does not in fact appear on the Monthly Scoreboard in June, with the high score at Cardinal Rule being Team Name's 110.5 points, good enough for 13th overall. Of the Top Ten this month, a whopping eight of the scores come from Lou Dawg's Ryerson, while the other two are naturally Hitch scores. June's Top Ten cut-off is high enough that only the top three scores from May 2015 would have made June 2015's list. The Mean Team of June, with the score closest to the Top Ten average, were Unbought & Unbossed: The Worst of Bruce Springfield!